This Horse Race is Rigged! While everyone in Louisville is focused on Derby, let’s talk about another horse race. One that’s been rigged for nearly a decade. When the Supreme Court ruled that districts could no longer use race alone as the determining factor for student assignment, Jefferson County came up with a more elaborate plan. It may have been well-intentioned, and it may have served the majority of students in JCPS, but it left one school in particular out in the cold. That school was the Academy @ Shawnee, in Louisville’s highly segregated and disenfranchised West End. A part of town where residents already suffer from high poverty, high trauma, high gun violence and drug influence, high rates of incarceration, food insecurity, lack of employment, lack of transportation, lack of shopping, higher rates of abandoned homes, and so on. You get the picture. While other schools used race, educational attainment of parents and zip code to determine which students would attend, and a target between 15% to 50% of families in the most affected tier was achieved, it was necessary for one school to have a much higher concentration of students in poverty in order for the plan to work. The Academy @ Shawnee was the only high school to have a saturation level of 87%. Its aim is to leave no school with more than half its students from low-income, low-education and high-minority neighborhoods. Except for Shawnee High School. Under the proposal, Shawnee would still draw 87 percent of its students from low-income, low-education and high-minority areas — more than double the rate of any other high school. Let’s talk about the student assignment map itself. In order to achieve this student assignment plan above, the district had to carve up the neighborhood immediately surrounding Shawnee and assign the students to one of a dozen or so schools around Louisville. Then to fill Shawnee, they had to backfill from the Portland and Highland neighborhoods. District officials could have created a satellite attendance zone for Shawnee in a more affluent area of Jefferson County to diversify enrollment. But they chose not to. And if the school had been given the resources and supports, as well as some empathy and latitude when their high-stakes test scores do not keep up with a school like Manual, for example, so that they could focus more on meeting students where they are and less on “keeping up with the Joneses” authentic progress could have been made. But former Superintendent Hargens was tone deaf to those requests, which is why many members of the community, including our organization, pushed for her resignation, as well as the removal of board members who propped up her continued failures. And instead our community elected board members who vowed to hold her accountable and remove her. If one was paying close attention, they might think this horse race was rigged in order to make Shawnee an ideal sacrificial lamb for a conversion charter school. Bevin told us in December of 2016, there were going to bring Charters to Kentucky and they were going to start in the West End. Charters are NOT proven to improve outcomes for students of color. However, supports, interventions, smaller class sizes, less emphasis on high stakes tests, early childhood education, and 100 other things are. And on top of that, state law ties the hands of district leaders, forces adults and schools to “compete” for a Hunger Games type situation where the bottom 5% of schools continue to face radical punitive measures if they do not perform well. It’s dog eat dog, so collaboration from a peer at another school is out of the question when you’re both near the bottom. Administrators have lamented how they feel relief when another school fails, because at least it wasn’t them! It’s an awful paradox to put them in. 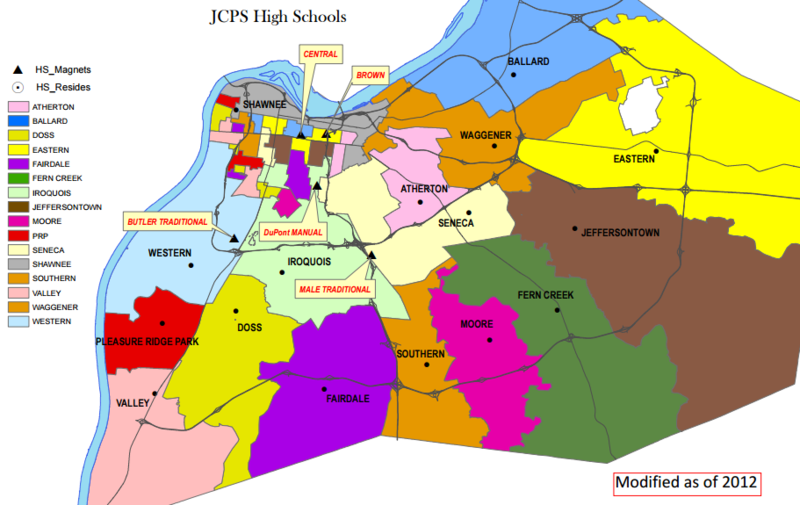 Why not try removing the unfair handicaps instead of taking JCPS down a path of privatization and even greater opportunities for waste and fraud?